Availability: In stock, ordered before 2 pm, delivered tomorrow. Thanks to Oolaboo you can tan at home without UV rays and toxins. Traditional tanning sprays are often packed full of toxins. The skin superb organic spray-on bronzer does not only give you a tan, but it also supports your skin effectively. Besides that the bronzer has a mango fresh scent, is organic, safe, non-sticky and dries quickly. The bronzer is easy to apply and ensure a healthy, natural and a tan without streaks, spots or root effect and without exposure to the harmful UV rays of the sun or solarium. 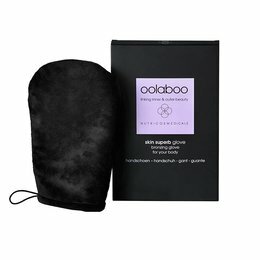 The luxury bronzing glove and / or bronzing brush ensures a streak-free, simple application for face and body, so the bronzer absorb into the skin nicely and smooth and leaves a gorgeous tan. Shake the flacon well before each use. Apply bronzer straight on the brush and apply to your face. Brush in a sweeping/whirling motion for a streak free result. 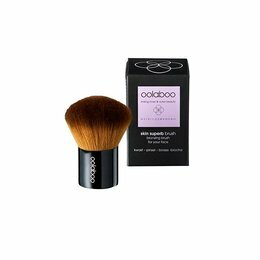 The brush will transform the bronzer in a perfectly equal result. Allow skin to air dry before dressing. Wait at least 8 hours before bathing. Wash your hands after use. Clean the brush frequently with warm water and let it dry. Shake the flacon well before each use. Apply the bronzer on the glove and or apply the spray directly to your body, use circular motions with the glove to ensure all areas are equally covered and blended. The bronzer will then be absorbed beautifully and evenly into the skin, leaving you with a stunning tanned glow. Allow skin to air dry before dressing. Wait at least 8 hours before bathing. Tip: using a scrub before applying the bronzer can give a better tanning result. 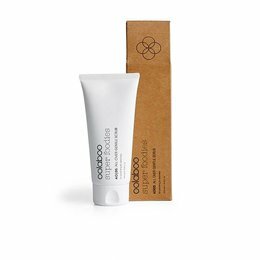 This product is 100% free of silicons, parabens, sulphates (SLS/SLES) and mineral oils, and 100% vegan.